Allan Harris sings during his debut performance of “Cross That River” on Wednesday night at the Henry Strater Theatre. Harris wrote the words and music for the show, which runs through Sept. 18. Allan Harris is a talented, funny and engaging singer and actor with a God-given gift for soul, jazz and the blues. He's also a hell of a history teacher. 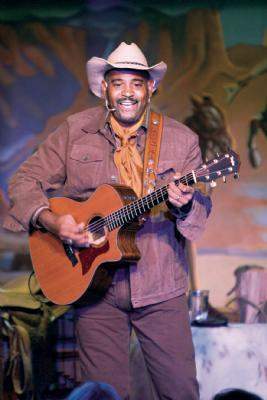 Harris' one-man show, "Cross That River," opened Wednesday night at the Henry Strater Theatre. Through music and the words of an ex-slave named Blue, Harris tells one of the most under-related stories of the American West: the role of the black cowboy. "Cattle don't care what color you are - horses neither," Blue says of his new job on the Chisholm Trail after escaping from a Louisiana plantation. Blue represents one of the thousands of black cowboys who headed west after the Civil War to earn a living in a new world with a new economy. The exact figure is difficult to pin down, but various sources peg the number of black cowboys between 25 and 40 percent of those who drove cattle from Texas to Abilene, Kan., on the oft-romanticized trail before railroads made the lifestyle obsolete near the turn of the 20th century. Harris' Strater show is a much smaller version of a show he hopes to land on Broadway later this fall with a cast of 13. It takes the form of a narrative, as Blue details the hardships of being sold down the river, growing up on the plantation and escaping, crossing the Red River into Texas (hence the show's title), working side by side with former Confederates and coping with the dangers on the trail including, but not limited to, Comanches and other native tribes. In short, it was a hard life. "The trail bosses were some of the most liberal thinkers this country's ever seen. If a man could do the job he was hired," Harris said. "It was a great thing for race relations. Southerners were forced to go out and work with black men and women, and it made this a better country." Harris grew up on a farm in western Pennsylvania where he first gained his love of, and curiosity about, the cowboy life. He cut his chops for years in the 1970s on the so-called "Chitlin Circuit," touring the American South in a school bus playing in small towns at churches and revival tents. But his love for the cowboy lifestyle drew him into the country and western music scene, and he now counts such luminaries as Vince Gill among those with whom he's performed. "Cross That River" includes samples of all his musical influences; soulful spirituals accompany Blue's time as a slave, there are cowboy songs such as "Buffalo Soldiers" (who were among the most brutal Indian fighters in the Old West). Harris' song is an original composition, not to be confused with the Bob Marley classic. All the music is infused with Harris' signature bluesy style, especially "Mail Order Woman" (which is about exactly what it says) and "Mule Skinner." All of the songs tell Blue's story, but there's a bigger message in both the music and the spoken words. "I wrote the story to empower children of color," Harris said. "If you take an inner-city child in 2009 and time warp back to 1865 it's like we haven't progressed at all - the literacy rate's the same, and the language even sounds the same. There was a time we weren't just dishwashers and picking cotton, and if young people can know this part of our history it will lift them up." If you go “Cross That River,” a one-man show by Allan Harris. Performances at 7:45 p.m. nightly except Mondays and Tuesdays through Sept. 18 in the Henry Strater Theatre. Tickets are $25 for adults and $20 for children, students and members of the military. Discounts are available for groups of 10 or more. Tickets are available by phone at 375-7160, online here or in person at the theater box office. "If you take an inner-city child in 2009 and time warp back to 1865 it's like we haven't progressed at all - the literacy rate's the same, and the language even sounds the same."